The band uniform expresses our respect for the military and our dedication to the mission. As a member of the 10th Mtn All State Marching Band, understand that military protocol is vital to this organization. 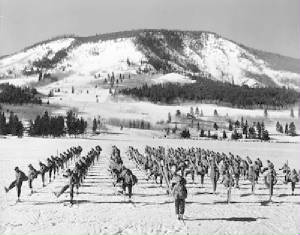 We are honoring a military division that played an important role in WWII and in the history of Colorado since the end of the War. They deserve all the honor and respect we can afford them. A marching band has much the same protocol as a military unit. Without it, the band would not function very well. Therefore, military traditions will be followed. All officers will be treated with respect and given the proper military salute when it is appropriate. This is very important when we are in the public eye, it shows them that we take ourselves very serious. It is only then that the public will take us serious and treat us accordingly. Use of the word "Sir" is also a requirement when addressing officers. However, during this period in time, it was only used at the end of a sentence or phrase. All uniforms are expected to be kept neat and clean and as historically correct as possible with proper insignia displayed. Shoes are to be "spit polished" as well. By following all these simple regulations, we are sure to have a great organization and the only one of its kind in the country! 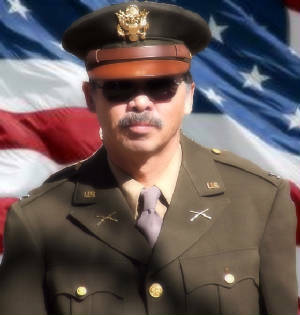 The official uniform of the band will be the "pinks and greens" style worn in WWII. All uniforms will include the waist belt on the four pocket tunic.The service hat will be worn by all. Each member will have to purchase or rent their own uniform (approx. $500.) This is necessary in order to maintain the integrity of the Band. We will order them once you have been accepted into the Band and have met all the necessary requirements! As a re-enactment organization, we will be as historically correct as possible with the uniforms and ensignia worn in WWII by the soldiers of the 10th Mountain Division! We wear them with pride while it is our honor to pay tribute to the men of the 10th as we march in parades all over the state.